The Hrant Dink Foundation was established in 2007 in Istanbul, following the assassination of Hrant Dink, the founder of the Turkish-Armenian Agos newspaper. The Foundation is currently turning the newspaper’s office – where Dink was assassinated on January 19, 2007 – into a site of memory and conscience. Since 2009, the Foundation has also overseen a project entitled “Media Watch on Hate Speech,” which raises awareness of discriminatory language against ethnic and religious identities, sexist and homophobic discourse and news containing hate speech in order to promote respectful language that supports equality and human rights. Here, the Coalition speaks with the project’s Coordinators Pınar Ensari and Funda Tekin. Over a third of minorities in Turkey say they are subject to hate speech in the media. Can you explain how your “Media Watch on Hate Speech” project addresses this problem? In Turkey, and in other parts of the world, discourse promoting racism, ethnic discrimination, anti-Semitism, homophobia and other forms of intolerance is widespread both in print and in social media. Our “Media Watch on Hate Speech” project has revealed that there has been a significant increase in hate speech in the printed press targeting at-risk groups in Turkey since 2009. Media monitoring reports on ethnic and religious discrimination indicate that hate speech in Turkey’s media most commonly targets non-Muslim minorities – Jews, Armenians, Christians and Greeks being the most targeted groups. Additionally, since the beginning of 2014, Syrian refugees have been increasingly targeted. More importantly, this type of discourse is often employed by politicians and commonly accepted as legitimate by media professionals and the public. This turns vulnerable groups into silent citizens unable to freely express themselves or participate in policy-making processes. Additionally, hate speech in the media also begets violence and hate crimes against the target groups. The aim of the initiative is to draw attention to discriminatory discourse, particularly against ethnic and religious identities, as well as sexist, homophobic and transphobic discourse, and news containing hate speech. The project aims to raise public awareness and reduce the use of hate speech in the media, to produce knowledge on the concept of hate speech and create a space for discussion so as to promote a more respectful and informed language on human rights and minorities. As part of our project, all printed national newspapers and approximately 500 local newspapers are monitored using keywords, such as: Armenian, Christian, Muslim, Jew, British, Kurdish, Turkish, separatist, traitor, infidel, perverted, reactionary and bigot. We identify news items containing derogatory statements, publish reports on our findings every four months and also post samples of our findings on our website every week – which is often widely disseminated through social media. The Foundation is the only institution since 2009 which has published systematic and continuous studies about the media and discourse in Turkey. Its work is therefore more comprehensive than other organizations which cover particular groups or specific time periods. 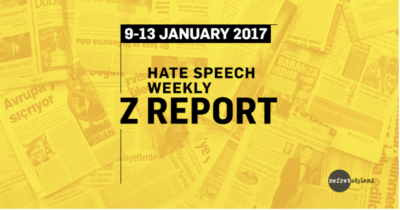 Along with efforts by academics and civic initiatives, this has helped raise the profile of the debate concerning hate speech in Turkey. How do you define hate speech? How can we separate it from free speech? And how does this issue relate to the larger mission of the Hrant Dink Foundation? Hate speech and discriminatory language allows unrest and common prejudice against vulnerable groups to take root in a society. In turn, targeted groups become fearful and silent and are forced to give up their right to participate in social and political life, which is indispensable in a democracy. Use of provocative and stigmatizing language can also lead to attacks against the members or gathering places of the groups that have been marginalized or portrayed as enemies. We strongly believe, however, in striking a balance between freedom of speech and freedom from discrimination. For this reason, we feel the most efficient way to combat hate speech is to speak against it, raise awareness and promote the use of a more respectful language and counter-speech, rather than encouraging lawmakers to legislate against hate speech since those policies may jeopardize the freedom of speech of those vulnerable groups who are actually most affected by dangerous speech. The Hrant Dink Foundation was established in 2007 in order to carry on Hrant’s dream of a future and better world where a culture of dialogue, peace and empathy prevails and individual freedoms, equality, inclusiveness and plurality are promoted. Democracy and fundamental rights and freedoms for everyone regardless of their ethnic, religious or cultural origin or gender is the foundation’s main principle. The Foundation works for a Turkey and a world where all differences are allowed, lived, appreciated, multiplied and conscience outweighs the way we look at today and the past. In this regard, we believe that drawing attention to the discriminatory language against ethnic and religious identities, sexist and homophobic discourse, and news containing hate speech, as well as raising public awareness against such publications and generating knowledge on the concept of “hate speech” are all vital to promoting fundamental freedoms and rights of minorities. It is important to invite the whole public in the collective combat against hate speech and discrimination. How has the advent of social media influenced the amount and vitriol of hate speech? Are people more unguarded on social media than in traditional print? If so, how can those concerned with social justice and equality guard against this? Explicitly, social media has paved the way for an increase in the dissemination of hate speech. Even though we are aware of the significance and dangers of online hate speech, our project has not yet developed a methodology for social media monitoring, although involving online media in the scope of the project is one of our aims in the near future. According to our observations, the content of hate speech is similar in online and offline media; what clearly distinguishes online hate speech is that people have less hesitations about expressing their hostile ideas due to the anonymity that online platforms provide. Social media can more directly reach and affect marginalized groups as well, and online hate speech seems to have more potential to disseminate feelings of hatred and provoke violence. On the other hand, social media also encourages free speech and expression; thus it opens up a space to draw attention to global issues and be used as an efficient tool for advocacy and awareness-raising. So, social media may well be utilized as a significant tool for spreading the word about the significance of combating hate speech online and offline and creating counter-speech against it. In your research, are you able to make strong connections between the amount of hate speech in media and the general views of the public? Do they consistently coincide? Turkey has recently witnessed polarization between various sections of the society for various reasons, and intolerance against difference or the “other” is becoming increasingly more common. As a result of the developments in the Middle East, especially the Syrian civil war, those involved in finding peaceful solutions to the Kurdish and Armenian “questions” are regularly targeted and certain ethnic groups are portrayed as enemies. Related to this polarization of Turkey, our media monitoring work reveals that there has been a significant increase in hate speech targeting at-risk groups in Turkey. In 2014, a total of 750 news items were identified as containing hate speech. In 2015 and 2016, this number almost tripled. Such hardline hostile discourse is most frequently encountered in ultra-nationalist or ultra-conservative publications and there is a decreasing trend in mainstream media. Mainstream media seems to convey discriminatory messages more covertly. One of the most striking findings in our recent monitoring is the rapid increase of media hate speech against Syrians and the rising hostility against Syrians among the receiving communities in Turkey. The high influx of Syrian refugees into Turkey together with the lack of a long-term socio-economic and cultural plan to integrate them into society, have turned Syrians into scapegoats in the eyes of nationalist publications and many Turkish citizens. The rise in hate speech is an increasing problem in the US and Europe. Have you noticed any global trends in your research? When it rises in one region, does it tend to rise in others? In Turkey, as well as in the world, discourse promoting racism, ethnic discrimination, anti-Semitism, homophobia and other forms of intolerance is on the rise. Hate speech and polarization negatively affect vulnerable groups as well as hamper political and socio-economic developments. They also have a negative influence on the refugee crisis, immigration policies, civil wars, other armed clashes, as well as fuel the rise of far-right and nationalist parties in many countries. Although targeted groups vary according to different countries and socio-economic contexts, hate speech is a global problem and instances of it correlate with others. For instance, the hostile language of nationalist parties around the world toward refugees and immigrants feeds into each other. It is also clear that when a country gets more polarized, hate speech, intolerance and enmity discourse tends to rise in that country. Hence, it is necessary to monitor the repercussions of this racism, discrimination, xenophobia and prejudice in different contexts and to trace the latent connections with a global perspective. It is also of paramount significance to develop international collaborations that would include carrying out comparative discourse studies, learning from other experiences and creating common ground on which to devise novel and innovative forms and methods of combating discrimination and hate speech worldwide.